Education and community initiative Project Booyah is literally changing lives in the Redlands. Currently 10 local teenagers are participating in Project Booyah in the hope to complete vocational education and gain a job after dropping out of high school. Fifteen-year-old Alexandra Hills automotive trainee Brandon Cunningham shared his experience of completing Project Booyah, run by the Queensland Police Service, with the 10 new starters this term. Alexandra Hills teenager Brandon Cunningham is training to become an automotive mechanic at Australian Industry Trade College after being inspired through Project Booyah. “I was feeling pretty depressed after being suspended from school for fighting and soon after that I started Project Booyah,” Brandon said. “The police officers helped me get through and helped me find opportunities. “I did a Certificate II in hospitality and then a Certificate II in construction. 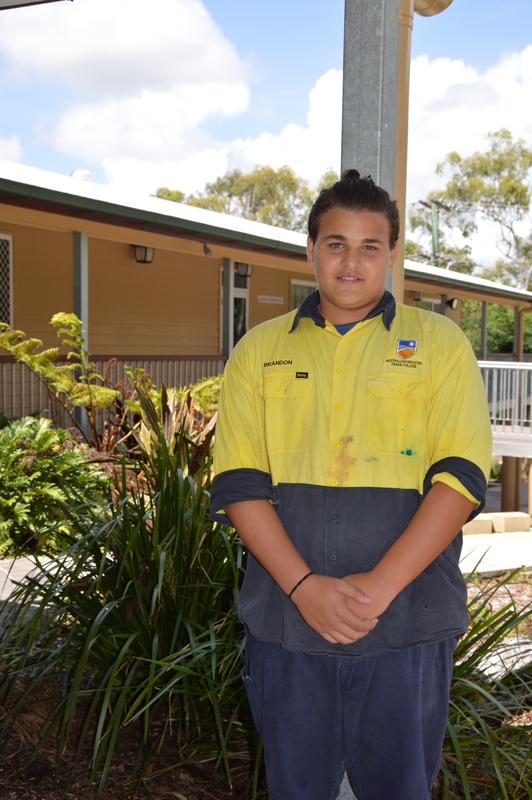 “This year I’m doing a Certificate II in automotive through the Australian Industry Trade College, involving four to five week blocks of TAFE and then two weeks of work experience. Project Booyah is run by the Queensland Police Service from the Lions Club Jeffrey & Geraldine Underhill Community Centre at Capalaba. Redland City Mayor Karen Williams applauded the program as it invests in the region’s youth. “Redland City’s youth are an important part of our community and they are the leaders of tomorrow,” she said. 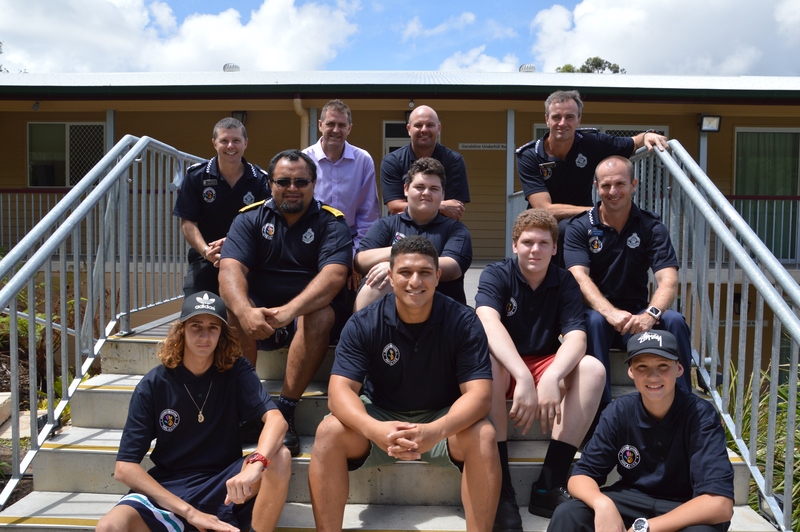 Redlands locals participating in Project Booyah this year are (front from left) Sebastian Hayward, Helaman Samuela, Tien Rogers, (middle from left) Police Liaison Officer Tom Govenor, Josh Goodman, Emmett Jones, Redlands Coordinator Senior Constable Dave Alley, (back from left) Detective Acting Sergeant Nick Churchley, Redland City Council Officer Doug Hunt, Youth Support Officer Jason Evans and Acting Inspector Ian Frame. Acting Inspector and Project Booyah Manager Ian Frame said he started Project Booyah in 2012 to help disengaged young people develop the necessary life skills to make better choices and start a career path to build their self-esteem. “I had been a police officer for 23 years and I just got sick of locking up young people who had committed crimes,” Acting Inspector Frame said. “It dawned on me as I was locking up a kid who had done an armed robbery, whose father was in prison for serious offences, that we had to change this cycle. Today Project Booyah is run in nine locations across Queensland and is assisting about 85 teenagers. The program has an amazing success rate: 86 per cent of young people who start the program complete it, the majority of participants end up with a job and criminal offending reduces by 67 per cent. Redland City Division 9 Councillor Paul Gleeson thanked the Queensland Police Service for assisting young people in his region. “This program’s results really speak for themself,” Cr Gleeson said. Project Booyah is funded by the Queensland Early Intervention Police Program and Skilling Queenslanders for Work. Acting Inspector Frame said he is currently looking to supplement the program’s funding with sponsorship from the private sector. “This is an excellent program for the corporate sector to be aligned with as it is encouraging the very same ethics and skills needed for a successful workplace,” he said. For more information on Project Booyah click here. To view Council’s Youth Strategy click here.